One of Paris's most charming, mythical and quirky places to wander, the Montmartre neighborhood crowns the city, situated in its hilly northern heights. It oozes poetry and charm: come here for winding cobblestone paths, ivy hanging from wooden window panes, views of the majestic Sacré Coeur from café windows and myriad local shops selling cured meets or delicious pastries and breads. All this, and much more, awaits you in this legendary district, which manages to retain charm and authenticity in spite of being quite touristy in certain corners. Shop for quirky, handmade clothes and jewelry, visit museums or simply brave the snaking, often precipitously hilly streets until you reach the top. Once at the summit, you can enjoy spectacular panoramic views of Paris: these make the thigh-busting walk up the hill completely worth it. Of course, if you prefer to take the funicular at some point up to the very top, no one will fault you! Montmartre is located on the city's rive droite (right bank) in the 18th arrondissement, just south of the periphery leading into the northern suburbs, and north of the Pigalle area, infamous for its red-light district. To reach the area, the easiest solution is to hop on lines 2 or 12 of the Paris metro and get off at any of the following stops: Anvers, Pigalle, Blanche (line 2), Lamarck-Caulaincourt or Abbesses (line 12). Main streets to explore: Rue des Martyrs, rue Lamarck, rue Caulaincourt, rue des Abbesses. Also make sure to walk around the tiny, charming streets behind Sacre Coeur which retain a distinctively village-like quality, including Rue des Saules (Paris' only remaining, tiny vineyard can be found here), and rue Ravignan, where Pablo Picasso's primary studio, "Le Bateau Lavoir", sits at the corner of place Emile-Goudeau. The hill ("butte") on which Montmartre, and the famous Sacré Coeur, sits, has been used for centuries for protection in battle. During the Siege of Paris in 1590, it became the prime spot for Henry IV to fire artillery down onto the city below. The butte’s height was again used in 1814 by the Russians during the Battle of Paris. By the late 19th century, the area had become a popular hangout for artists, singers and late-night revelers, with the Moulin Rouge dance hall and Le Chat Noir nearby. Then, in 1876, building began on the Sacré Coeur basilica, which was intended in part to honor the French victims of the Franco-Prussian war. Now, the area welcomes daily throngs of tourists, who continue to be charmed by the essence of “old France” that still hangs in the air. There are so many great places to explore in this neighborhood that it would prove tough to cover all of them. Here are just a few of our picks. See the guide to the 18th arrondissement for more ideas on where to head in the area. When this now world-renowned cabaret first opened in 1889 and introduced the French can-can, it was little more than a seedy joint for courtesans to entertain their male clients. Painter Henri de Toulouse-Lautrec was a regular patron, and later produced a famous series of the Moulin Rouge and its iconic red windmill. Now, the dance hall is more of a tourist attraction, offering nightly shows at some of the steepest prices in town. Still, many swear that it's well worth it. This permanent exhibition hall, situated near the ultra-touristy Place du Tertre and its eager open-air artists, is entirely devoted to eccentric Spanish artist Salvador Dali. Inside sit 300 of some of his most compelling works, from paintings to sculpture to rudimentary sketches. While the gallery holds the largest collection of the artist’s work in France, the Dali Theatre and Museum in Catalonia holds most of the zanily moustached artist's prized oeuvres. Sitting west of the area's hilly heights, nestled near Rue Caulaincourt, is this breathtaking 25-acre cemetery in the hollow of a former quarry. Famous artists who lived and worked in the area are buried here, such as French painter and sculptor Edgar Degas, Heinrich Heine, Gustave Moreau and filmmaker François Truffaut (of "Jules and Jim" fame). If you're started to feel overwhelmed by the hordes of tourists in some of the area's busier stretches, I highly recommend stopping in here for a bit of peace and tranquility. Animal lovers will appreciate this detail: a pack of feral (but tame) cats live among the graves, and can often be seen stretched out trying to get a bit of sun, or pawing at sparrows. Although this street technically leads out of Montmartre proper, its offerings in terms of clothing, food and gifts should be part of any visit to the area. The sloping avenue is the essence of the French “bobo” lifestyle – bourgeois bohemian. Take your pick between fresh flowers and fish, cured meats and cheeses, upscale Parisian bakeries (Montmartre has some of the city's very best), secondhand clothing and bookshops piled high with the latest reads. If you want to feel like a local for a day, hit this area on a Sunday, when locals meander the area for hours. Make sure to save room for carrot cake at the unfussy, laid-back Rose Bakery (at number 46), a favorite of the anglophone foodie community . Below are just a few suggestions for where to eat; for more, check out our complete guide to food and dining in Paris. 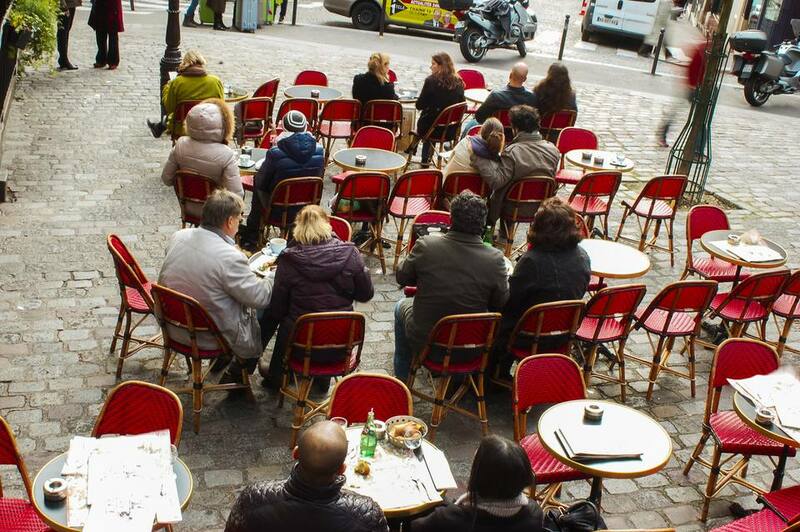 This once somewhat ordinary French café was made instantly famous after its stint in the film “Amelie.” Now, you’ll be hard-pressed to get a table here on a Saturday night. However, the afternoons are a great time to stop in for a coffee, and if you’re up for wine, the selection is really quite nice. Plus, you’ll never have so much fun going into a Paris restroom, where a glass cabinet holds a garden gnome and other film memorabilia. If you’re looking for a true neighborhood bar, La Fourmi – literally translating to “The Ant” – offers an undeniably more authentic Montmartre/Pigalle experience than some of the nearby cafes and bars, which cater more to tourists. This spot is perfect for getting a morning or afternoon coffee, when the place is nearly empty, or a light meal and drinks in the evening hours. Offerings include large salads and open-faced sandwiches ("tartines"). If you do come after 9pm, however be prepared to fight for a table with the locals – mostly twenty and thirty-somethings just out for a good time. Offering ample vegetarian options (a rarity in Paris), free wi-fi, and a cozy atmosphere, this café-restaurant is more San Francisco hippie than New York 5th Avenue. The menu is constantly changing, but some favorites to try are the Mexican soup, hazelnut cookie or pear and potato soup. Make sure to ask staff for the board games hiding in the cupboard, which you are more than welcome to play. Soul Kitchen is a quirky, homey stop with excellent food to boot.